Each chapter uses the same format for each technique, allowing you to quickly and easily identify the information you need. Evidence-based information throughout includes the latest data on ROM normative values and reliability /validity studies. Figures have easy-to-find dots that serve as anatomical markers, providing a fast visual reference for exactly where to place the measuring device. Complete coverage of the tape measure, goniometer, and inclinometer prepare you to use any tool in the clinical setting. 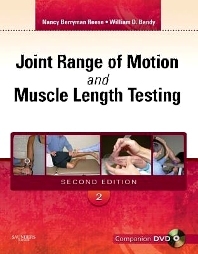 16: Measurement of Joint Motion in Infants and Children NEW!